Often Enterprise customers use ADFS in their networks for Single Sign On. Http Commander can be configured for work with Microsoft Windows Active Directory Federation Services. Microsoft Active Directory Federation Services server. We assume that DC, ADFS and Web server already installed and function correctly. Also AD version of Http Commander should be installed on Web server. And Web server should have SSL certificate installed and HTTPS binding configured. 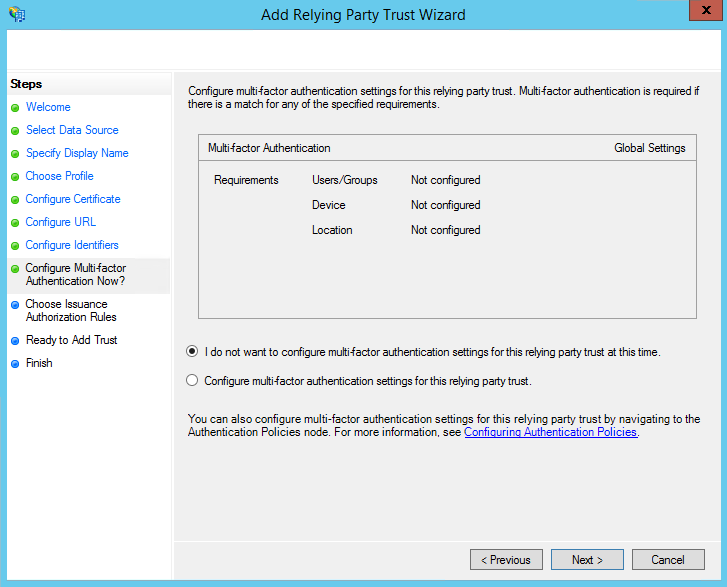 You will need to have Administrative access to Domain to complete this configuration . This tutorial is splitted into several sections. 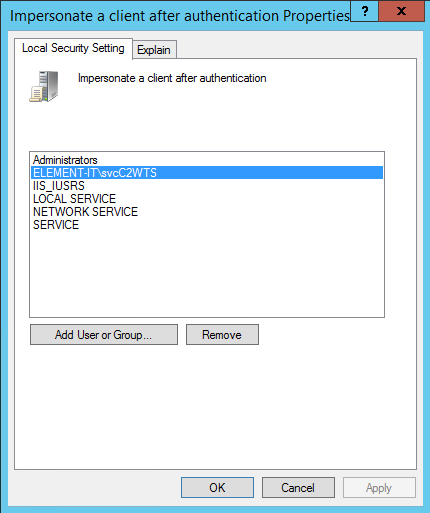 Create a service account in Active Directory to run the C2WTS service under. In this example, we have created 'element-it\svcC2WTS'. 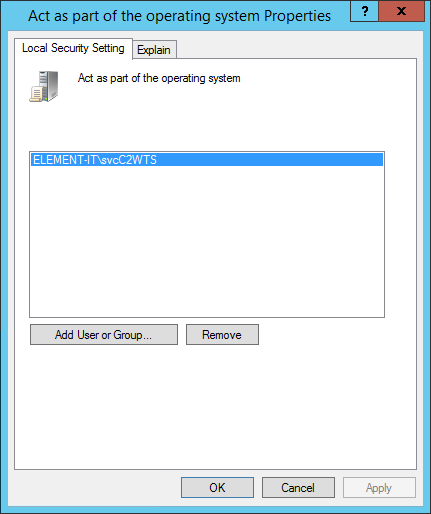 Add the service account (element-it\svcC2WTS) to the local Administrators Groups. 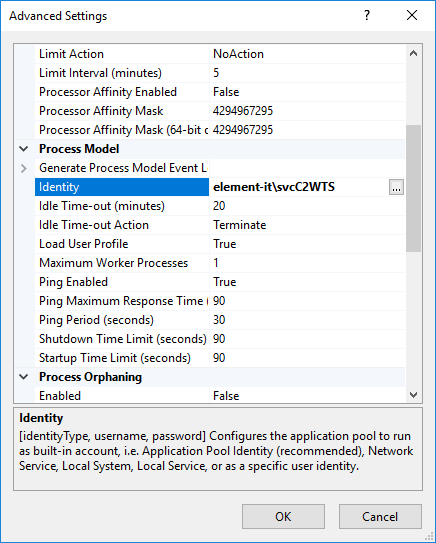 Configure HTTP Commander application pool to work under the service account (element-it\svcC2WTS) and to load user profile. Open IIS management console: Control panel->Administrative tools-> Internet Information Services-> and then "Application pools". Open "Advanced settings" of htcomnetpool application pool. 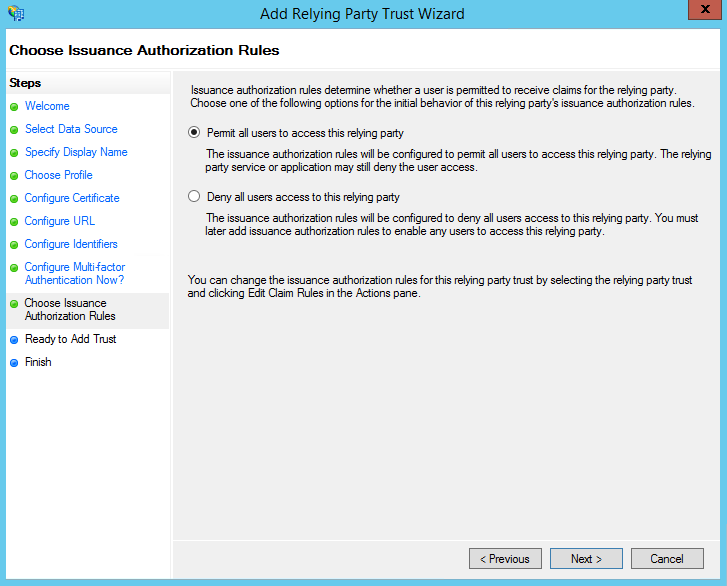 Change "Identity" setting to use the service account (element-it\svcC2WTS). Change to true the value of the "Load User Profile" setting. We are ready to configure HttpCommander. Open web.config file in editor. Please note that FileWebDavModule module should be added to the end of the modules list for correct work of WebDav with ADFS. Here you will need to replace https://webserver.element-it.local/htcomnet/default.aspx with url to Http Commander on your server. Uncomment (or add if not exist) system.identityModel.services section at configuration section. Here you will need to replace https://webserver.element-it.local/htcomnet/default.aspx with url to Http Commander on your server and https://adfs.element-it.local/adfs with url to your ADFS server. 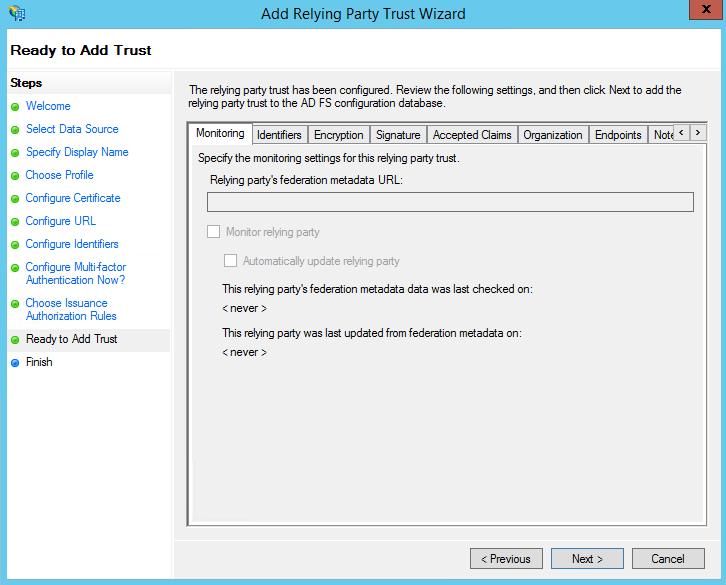 Uncomment (or add if not exist) system.identityModel section at configuration section. 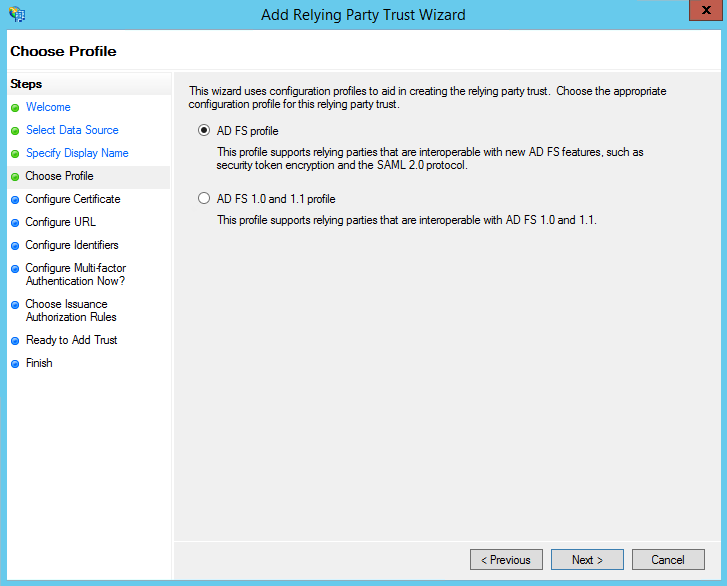 Also you should replace the value of the thumbprint attribute with the thumbprint of Token Sign certificate of your STS server. 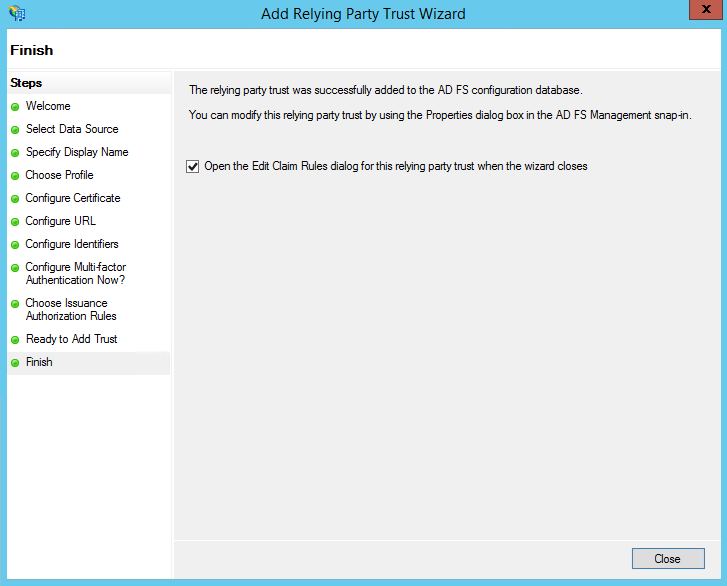 Open AD FS 2.0 Management > Service > Certificates then right-click on the Primary Token-signing certificate and choose View certificate. Click on the details tab to view and record the thumbprint from the Thumbprint field. An example of a thumbprint is: 77 5D 64 8E 73 62 C7 69 45 97 DB 5B BD 39 16 C5 F2 76 8C C1. NOTE: when you use the clipboard to copy-and-paste a certificate thumbprint, you may get an invisible Unicode garbage character. Make sure that you did not selected any extra "space" at the beginning of the thumbprint. 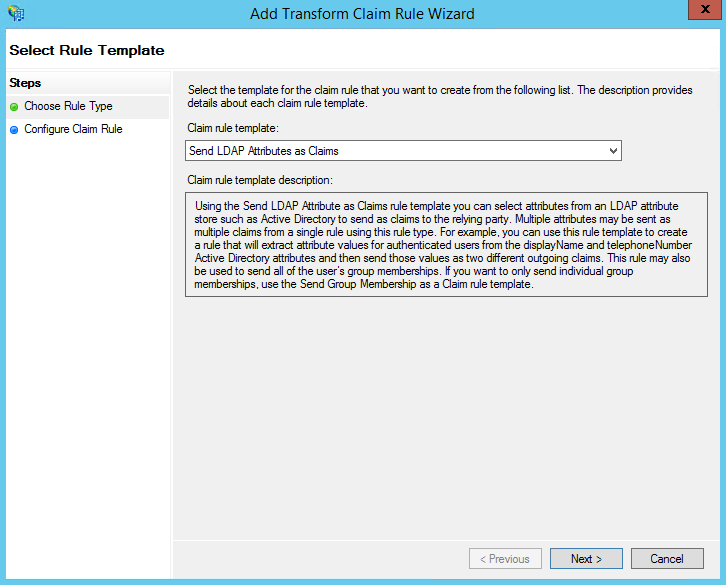 Configure Logout.aspx page to force logout from adfs. Open Logout.aspx page in text editor. Where adfs.element-it.local domain should be replaced with domain name of your RP STS server. As last step, you will need to set correct value for the LDAPConatiner setting either in HttpCommanderSettings.config file or on Settings tab in Admin Panel. This is required to get user group membership and home directory from AD. 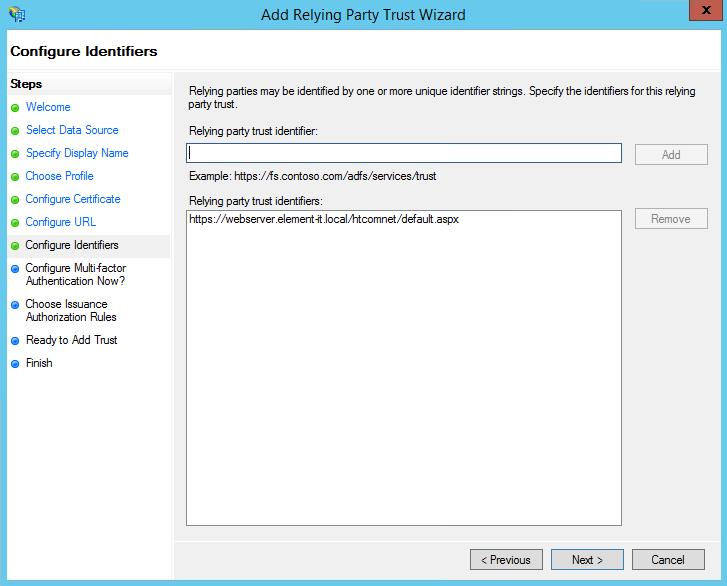 Open AD FS management console and navigate to Trust Relationships, Relying Party Trust section of left tree. 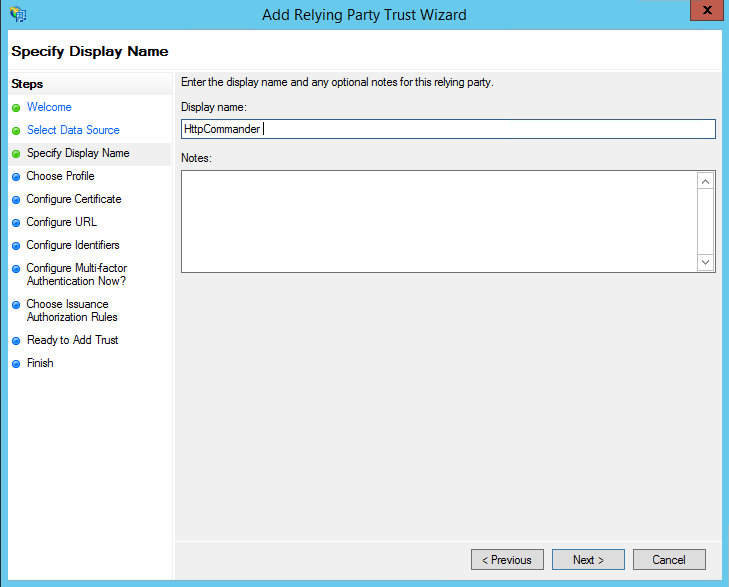 Click on Add Relying Party Trust to start wizard. 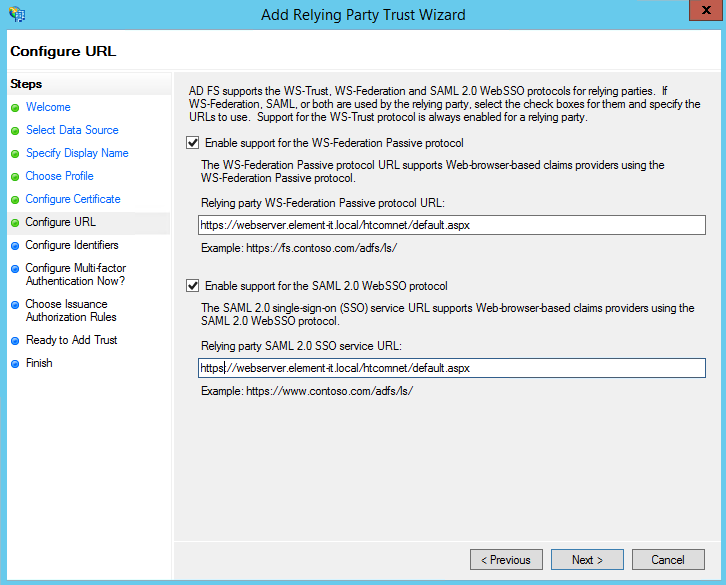 On next screen select option "AD FS profile"
Check options Enable support for the WS-Federation Passive protocol and Enable support for the SAML 2.0 WebSSO protocol. For both options set full url to Http Commander application. In our case it is "https://webserver.element-it.local/htcomnet/default.aspx"
Relying party identifier should be already added to the list. So you can simply proceed to next step. Complete wizard with next several screens following on-screen suggestions. 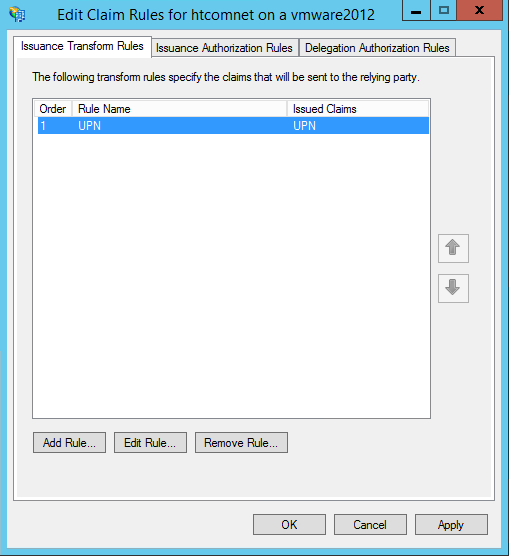 Only UPN claim is required to be configured for correct work. Configure it as shown on screenshot. HTTP Commander also can get information about display name from following claims (if specified): displayName, fullName, givenName. Information about home folder is expected in following claims (if specified): homeDirectory, homeFolder. Now configuration is complete and we are ready to test Http Commander. If all configured correctly , after authentication Http Commander interface should be loaded. Open diagnostics.aspx page and check its output . Make sure that application works under logged in user identity (impersonated ). If you plan to use Network shares, process to next section. Once authenticated HttpCommander will work under logged in user identity , It means that all existing NTFS ACLs will be respected, but only for local folders on Web server. 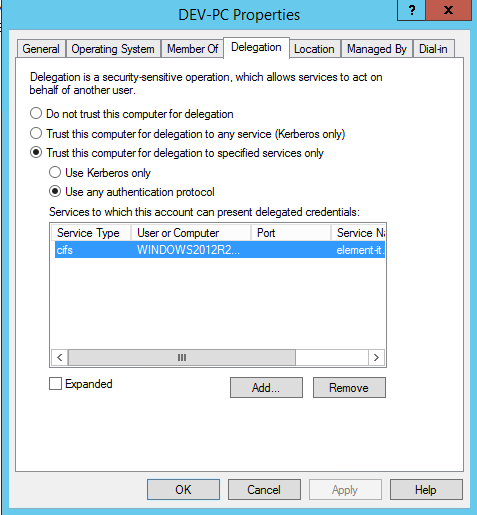 If you plan to use Netwrok Shares (that is common practice), you will need to configure Delegation for web server and service account. Please note that command should be executed under domain admin account. Configure delegation for web server. 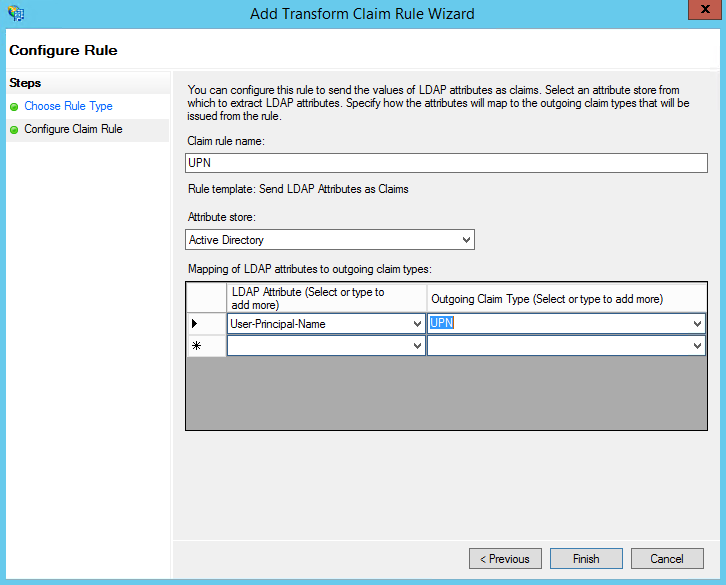 Repeat last two steps for LDAP service and your Domain Controller. In the left pane, Expand Users folder. 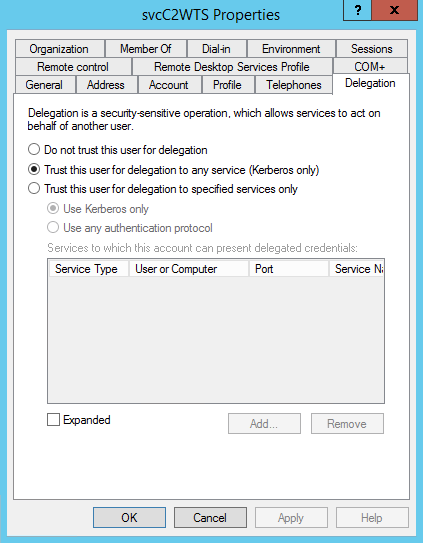 In the right pane, right-click the Service account (element-it\svcC2WTS) which is configured for C2WTS service, select Properties, and then click the Delegation tab. Click to select Trust this user for delegation to specified services only. Ensure that Use any authentication protocol, and then click OK.
Click the Add button. In the Add Services dialog box, click Users or Computers, and then browse to or type the name of the File server that will be used in Http Commander. Click OK. In the Available Services list, select theCIFS service. Click OK. Note: For correct work of WebDav module it should be placed at the end of the modules list, after SessionAuthenticationModule and WSFederatedAuthenticationModule modules.